Once the Star Wars Fat Quarter Bundle was put together, we knew it had to be given away! Everyone has a chance to win, all you have to do is leave a comment on this post answering the question below and you will be entered to win. The giveaway will end at 2pm PST, Monday, June 11th. The winner will be chosen by random.org and announced by the next day. My kid would FLIP. His favorite is Chewbacca. I am an Obi Wan fan. I love the Grisly Homestead bundle! I pinned it. I'm on the mailing list, of course! R2D2 - my whole family, even the grands! My favorite is Obi Wan! I subscribe to your mailing list with my hotmail account. Thanks for the chance to win! I signed up for your mailing list! Thanks again! My absolute favorite is Boba Fett- I try to pick up anything with him on it! I am already on the mailing list! Woah, what amaaaazing fabric!! I know someone who would love a Star Wars quilt. I've got everything crossed! Posted on FB (Michala Thake), there's only me, I'm unique! Han solo always did it for me. i POSTED THIS ON FB "ravenztarot"
i would love to ahve this! i follow you! and get the newsletter. Well, my son is named Luke, so I'll have to go with Luke Skywalker! My favorite character is C3PO. He's logical, clueless and so shiny! What's not to like? This would be so cool to win. My baby brother was a Star Wars FANATIC as a kid! Now he's a Lt. Col. in the AF, would love to make something for him from this fabric! I already follow and get the newsletter! My favorite is Obi Wan, my granddaughter loves Star Wars also. Hans Solo - Harrison Ford as a "youngster" is my favorite SW character. I've always been a Yoda fan! I'm already on your mailing list. Hmm - Yoda or Princess Leia! I think I'd have to pick Chewbacca!!! Thanks for the chance to win! I'm on the mailing list!!!! I'm married to a star wars nut so this is a tough question. I think I'll go with Leia though. She is strong and independent yet feminine. R2D2 has always been my favorite by far! I'm on your mailing list too, thank you for the giveaway, my husband was thrilled to see this line come out! Princess Leia!! But with a newborn son Im sure it will change. ;) Added to mailing list! PS- I'm not a robot! Yoda is my grandson's favorite so it's mine also. I've added it to Facebook. Han Solo is one of my favorites. I've pinned the bundle too. My favorite has to be Yoda! There is no try, just do! Words to live by!! And I just tweeted @MandyktMade. Anyone would think I wanted to win or something!!! I don't really know much about Star Wars, but my nephew likes it. He was pretending he was on a speeder and doing Star Wars when he fell off the couch and broke his arm. He'd LOVE something made out of this! Yoda is my fave, even though I have been using my son's Darth Vader lunch box to guard my lunch at work. No one messes with the dark side! I love the Ewoks, so cute. I'm kind of boring, I like Yoda. But I love the look of Darth Vader... He looks tough! Yoda ... and may the force be with me! I'm on your mailing list. Thanks for the chance! Oh great fabric!! My husband would love this!! I think for me Chubakka or R2D2 are my favourites! They both just make odd noises - grunts and beeps. My kind of men - not too talkative!! I pinned both the warm and cool prism bundles to my account! I have been looking for a good rainbow bundle! I do get the newsletter.. you have great prices and lots of fun ideas. My favorite I guess is R2D2. I have the breadmaker that resembles him. LOL! I love this fabric! My favorite is Han hands down. Han Solo, of course & Ewan McGregor's Obi Wan are my faves! 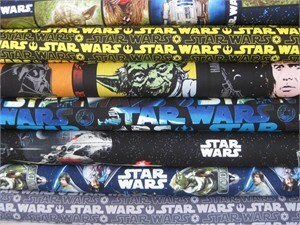 But I have 2 GDSs that LOVE everything Stars Wars - can I get 2quilts out of 1 fat qtr bundle??? May the force be with me! I subscribed to your newsletter long ago. R2D2- and he is a robot! (Underneath this message box says "please prove you're not a robot:). Pinned my favorite bundle- Summer Riding. I always loved the Ewoks! I "pinned" In the Neighborhood FQ bundle on my board "Fondle the Fabric." My son is obsessed with storm troopers. Harrison Ford is the best-- good looking, adorable and funny. I know his character is Han Solo, but it's really him that I love! My husband is a Stars Wars lover and his favorite is Darth Vader. I prefer the ewoks, they are too cute! Really, what girl growing up watching Star Wars wasn't in love with Han Solo? I feel some pajama pants and pillowcases love! They did such a great job with this original collection! These look way too fun! I'm also on the mailing list! I think my fave has changed as I've gotten older. When I was little, I thought Luke was cute. As I got older, I started to appreciate the rogue Han Solo!! I am subscribed to the mailing list. I love me some Obi! Yoda - what cute fabric! C3PO. How can you not love a possibly depressed mechanical man? And I am on the mailing list. My favourite character is R2D2. Nothing happens in the movies without him! Favorite Star Wars character is C-3PO!! I'm on the mailing list, too.